— This article by Jerry Cates and Adette Quintana, first published on 13 February 2010, was last revised on 23 April 2016. © Bugsinthenews Vol. 11:02(06). I hope you are doing great and keeping WARM!! We have two new rescue dogs. I will be sure to include you in the email about them. Maybe you know someone who would be an excellent home for either of them. Note that the photos shown on this page, and on all other pages of Bugs In The News . info, may be enlarged for close-up viewing by positioning your cursor over them and left-clicking your mouse. David and Adette have been battling scorpions in their home and yard Recently, they also began seeing a few of these large black spiders, and that was almost as troubling as the scorpions. Until, that is, she learned that they are signs of a healthy lawn. Background : Adette and her husband own a relatively large ranch in rural Bastrop County, Texas, that is forested with mature oaks, hickories, cedars and pines. Their home is near the center of the ranch, and is over 20 years old. The home itself, and the immediate area around it, were badly infested with striped bark scorpions (Centruroides vittatus) when they moved in last year. A snake skin was also found, suggesting that snakes may be abundant in the area. Of course, both of these organisms are common inhabitants of the area, so working out a PestAvoidance program, which Adette and her husband have now begun to carry out as a do-it-yourself project, was a good idea. Though the program appears to be working to help them avoid scorpions and snakes, the mode of action for their particular program is such that certain other organisms in the same environment may not be affected. Actually, that’s a good thing, but only so long as the other organisms are not dangerous. Beginning in the fall of 2009, for example, she noticed a few relatively large, black spiders in her home. They were slow-moving, and not aggressive, so Adette scooped each one up on a piece of cardboard and carried it outside “where it belonged.” I’d surveyed the spiders in their home when they first moved in, and besides some spitting spiders (Scytodidae: Sytodes), and a few wolf spiders (Lycosidae), nothing of significance had been noted. These new ones were a kind of spider she had not seen before. When she called me about them several weeks ago, I asked if she would take some photographs that would help identify them. This e-mail was her reply to that request, delayed by several weeks until she found a suitable specimen to photograph. The Photograph: The original image was very dark, and showed few details, so I used image enhancement software to bring out some of the subtle features and created a line drawing that could be annotated. You may want to click on these images to enlarge them; then just click on the back arrow to return to this post. I’m used to working with low resolution imagery, and often have to use minimal cue analysis to pull out indistinct features that, when combined, often tell a lot about the identity of the organism. This is one of those cases where using minimal clues is required and–fortunately–produces positive results. Paraxial Chelicerae: Notice how the mouthparts (chelicerae=jaws) of this spider project outward, from the face, a considerable distance. Look closely and you will see an indistinct line that separates the jaws (chelicerae) into left and right halves. These end, at the face, such that the line of separation is roughly perpendicular to the forward margin of the face (the leading edge of the spider’s clypeus). Common spiders, in the Araneomorphae, have chelicerae that drop sharply downward at the clypeus, rather than projecting outward as with this spider. Thus, it is not an araneomorph, but a mygalomorph, i.e., a member of a group that includes tarantulas and trapdoor spiders. This is an important point to make early in the identification process, as it narrows the range of candidates considerably. Hard Shiny Carapace: Now notice that the carapace (the part of the spider between the mouthparts and the abdomen) appears hard, black (or very dark brown), and shiny. That clue comes from the small, but telling glint of light off a portion of its lower left quadrant. It’s another important point. A glabrous (not hairy) carapace that is hard, very dark, and shiny is characteristic of certain mygalomorphs, and does not include the tarantulas. Some tarantulas have a hairless carapace, but the surface is leathery, not hard, dark, and shiny like this one. Enlarged Distal Pedipalps: Notice next that the pedipalps (two diminutive leg-like appendages extending from the face outward, in front of the spider) are greatly enlarged at their distal ends. See, in particular, how the far ends of these appendages are swollen, while the segments attaching them to the face are slender stalks. This tells us the spider is a male, as the swelling at the end of each pedipalp–and this happens to be true for araneomorph males as well–serves as a sperm reservoir, and is used to physically transfer sperm to the female’s epigynum during mating. The female pedipalp, by comparison, is more like a diminutive leg throughout its length (the distal end is not enlarged). Projecting Spinnerets: Another characteristic of the mygalomorphs is that, in most cases, their spinnerets project outward, beyond the posterior edge of the abdomen. Notice that is the case with this spider. Now, some of the araneomorphs have this same anatomical character, most notably the Agelenidae–the funnel-web weavers. But the agelinids (and all the rest of the araneomorphs) don’t have paraxial chelicerae, so that takes them out of the running. This spider has stout legs, and if you look at the two legs on the right side at the top of the image, you will see that the last discernible segment, which is actually two segments (the tarsus and metatarsus), joins to the tibia where the proximal end (the end closest to the spider’s body) of the tarsus is noticeably bowed. This is a common feature seen in a number of trapdoor spiders. other important characteristics in the legs that cannot be seen in this photo but that, if we could see them, would tell us more about the species. 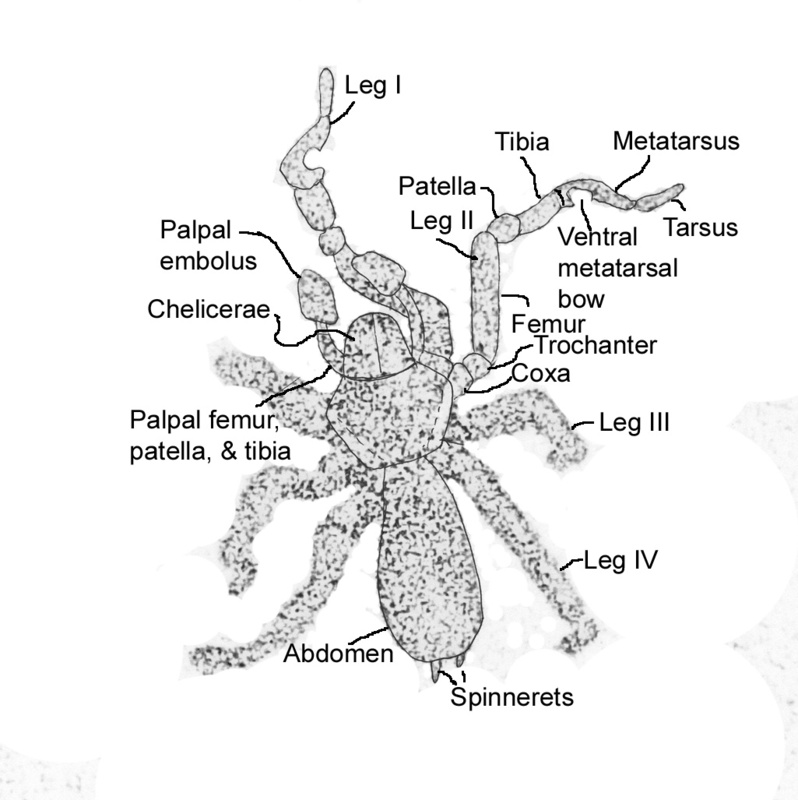 For example, if the tibiae of legs I and II sport large mid-ventral megaspines, that would place this spider in the genus Eucteniza; though these structures may be present on this specimen, we cannot see them clearly. But suffice it to say that males of many if not most species of trapdoor spiders are prone to leaving their burrows in search of females following a cold rain. From all indications, this one did just that, but failed to find a mate before the freezing cold air brought its life to an untimely end. The pursuit of a mate carries certain risks, and this fellow went to its reward doing what nature demanded. 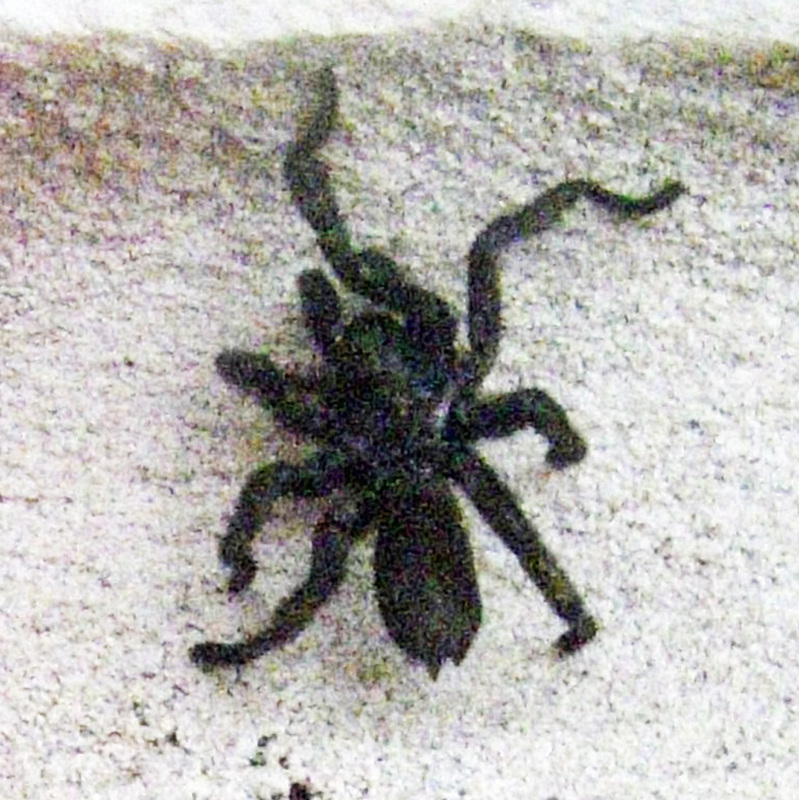 North American Mygalomorphs in General: It happens that the mygalomorphs, as a group, are capable of delivering a painful, but medically insignificant bite. Your experience may vary, depending on your particular sensitivity to allergens etc. Any time you are bitten by a venomous critter, you should watch for signs of complications, and if such signs are observed (usually within the first couple of hours), it is important to consult a medical professional immediately. It is unlikely, in any case, that you will even experience a bite from a trapdoor spider. Like the tarantulas that they are closely related to, they only bite if provoked. Trapdoor Spiders are Beneficial Yard Fauna: Over 120 species of trapdoor spiders have been identified worldwide, where they prey on organisms that are smaller, about their own size, or slightly larger than they are. In North America, these spiders are large enough to prey on fairly large insects, and if you find them in your home or on your patio after a cool rain, that is a good indication that you have a healthy yard. In fact, if you don’t see any trapdoor spiders in those places, your yard may not be as healthy as it should be. It’s easy to make your yard unhealthy. Broadcasting broad-band pesticides, for whatever reason, will often kill these spiders. That’s counter-productive, because trapdoor spiders, along with the wolf spiders in the Lycosidae family (which are also killed en masse when broadcasted pesticides are applied in yards) are very good at killing many of the bugs you are putting pesticides out for. In other words, putting pesticides on your yard usually kills a lot more than “bad” bugs. More often than not, such pesticides also kill the “beneficial” ones, like the trapdoor spiders. That, of course, makes things worse, not better. Now, what should be done about these spiders? Good question. They are not nearly as prolific as scorpions (they rely on food that drops by, not on actively searching for prey the way scorpions do), so the danger of their populations skyrocketing is rather small. At the density seen in Adette’s yard, they are probably good at preying on scorpions, so their presence would reduce the scorpion population. They attack just about every arthropod — besides their own species — that comes too close to their lairs, so scorpions would be wise to avoid getting too close. I am inclined, for this reason, to want as many trapdoor spiders in my yard as the yard can support. That means not broadcasting pesticides of any kind, and not extending the use of habitat modifiers (essential oil sprays and granules) beyond the perimeters of yards and structures, by broadcasting them except as part of a habitat modification project carried out to control ticks and fleas. Adette is one of those special people who has an appreciation for the importance of maintaining a healthy ecosystem in her own yard. Every trapdoor spider she’s found in the house got picked up and taken outside, unharmed. She knows now that these spiders do not pose a risk to her or her family, and actually provide benefits to the yards they live in by preying on insects they encounter there. I would love to hear more about keeping scorpions out since I had an issue with them last summer. I sprayed about the house (inside and out) with a spray that said it would kill scorpions but how do I make my yard unattractive to them alltogether? Thanks for letting me know this spider was found in San Antonio, as these spiders are not found everywhere in the U.S. and we like to keep track of where new ones pop up. Let’s talk about scorpions: Next time you see one, take a photo (your camera provides excellent resolution and color depth, which lets me bring out subtle features that ordinary cameras don’t even record) so I can identify it to species. Adette’s critters happened to be striped bark scorpions (Centruoides vittatus), whose dietary and foraging habits are well known and involve nocturnal (nighttime) hunting for insects. Because of this, they frequent, within their range, areas where insects are plentiful, and are scarce or nonexistent where insects are not found. The trick, then, is to lower the insect population in your yard, particularly that part of the yard around the perimeter of your home. Once you do that, the scorpions will disappear in those areas and will stay out of the house. They go where they can find food, and stay out of areas where food is not in good supply. The approach I take to keep pests out of areas where they are not wanted is what I call IRIM-P.A., or Integrated Reduced Impact Methods to achieve Pest Avoidance. It is a trademarked program, the result of years of research into what works best to avoid pests without creating an imbalance in nature that makes the problem worse than before. Some, contrariwise, would advise spraying the entire yard with a really strong insecticide. They think “Voila! The insects will be killed, and the scorpions will disappear!” But no, that’s not what happens. If you use insecticides to kill all the insects in a yard, you’ll enjoy an insect-free yard for a few days or weeks, before the insect population rebounds. When the insects return (and yes, they will come back), they show up in larger numbers than before. Even worse, the mix of insects that returns is usually top-heavy with the more voracious species that do the most damage. This happens because the insecticide you sprayed killed their natural enemies. Most of the natural enemies of insects are small, somewhat fragile, beneficial parasitic and parasitoid insects that are extremely susceptible to insecticides. I discuss how this works, in a separate post on the puss caterpillar’s natural predators. You may want to read it. The object, then, must not be to kill the insects, but to modify the environment in the yard so that it no longer attracts or nurtures them. What I’ve been working on is a mix of essential plant oils, diluted in a cedarwood and corncob meal (for granular applications) and mineral oil (for spraying) base, that–when applied to the area where you want to be free of pests–creates an environment that pests just stay out of. These materials are not pesticides, because they are not applied to kill pests. They are not repellents, either, because they are not applied to repel pests. All they do is produce an environment that does not attract or nurture pests. And that is enough. As people like Adette, who now enjoys a home free of scorpions, can attest, these products work without killing anything. And because they work that way, they don’t lead to a later insect rebound that is worse than before. In fact, they insure that the surrounding area, outside the zone where our IRIM-P.A. (Integrated Reduced Impact Methods, Pest-Avoidance) program is used, the natural balance of nature is maintained. If you use IRIM-P.A. methods and products around your home for a while, and then stop, the insects and other pests will slowly return, but not in larger numbers than before, because their natural predators are still as strong and plentiful as ever. They just re-populate the areas they used to live in before, in about the same numbers and mixes as before, as those areas begin to attract and nurture them the way they did in the past. I’m in the process of documenting the research behind our IRIM-P.A. program, and will be posting it soon on another website, http://organiserve.com/. The information on that website will eventually explain how IRIM-P.A. works, and will provide instructions on how you can implement your own IRIM-P.A. program, as a do-it-yourself project. We will be making our line of IRIM-P.A. granules and sprays available through that website as well. In the meantime, feel free to call or e-mail me (my telephone number is 512-331-1111, and my e-mail address is jerry.cates@entomobiotics.com;both are also posted under the CONTACT US page at the top of this website) for more information.